BigFurnitureWebsite presents dining tables, formal dining tables, kitchen tables, round tables, square tables, rectangular tables, pedestal tables, glass tables, metal tables, wood tables, pub tables and counter height tables in nearly every shape and finish style. Complete your dining room with dining seating, including dining side chairs, dining arm chairs, upholstered dining chairs, bar stools, counter height chairs, wooden bar stools, upholstered bar stools, sports chairs and more. Browse our catalog of china cabinets, china hutches, buffets, sideboards, servers, baker’s racks and other dining storage to top things off. BigFurnitureWebsite can help you find the perfect formal dining set, casual dining set, dining table, kitchen table, stone top dining table, pub table, bar, bar and barstools, dining chair, china cabinet, server, buffet, or baker's rack. 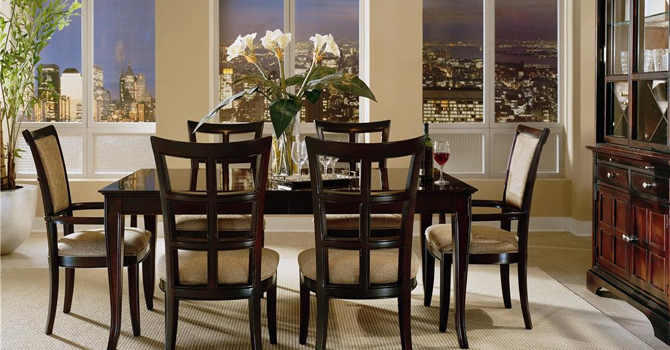 BigFurnitureWebsite will also help you find a dining room retailer nearest you to complete you purchase.